James Halpin, communications major, 20. 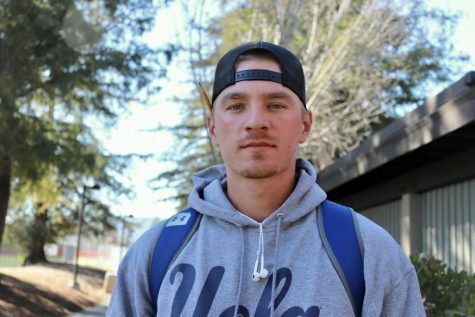 According to De Anza College’s right fielder James Halpin, 20, communications major, baseball is tough and requires the right mindset to have confidence in one’s skills and training, which he constantly encourages his teammates to have. Halpin started his baseball career early on at the age of five, and from there he continued to play in multiple different leagues until he came to De Anza to play for the Dons. This is now Halpin’s second year at De Anza, and he currently has a batting average of 0.444, six doubles, two home runs, and a 0.543 on base percentage, through only 15 games into the season. Despite having a challenging preseason schedule and the team being forced to deal with adversity, Halpin remains confident for the rest of the season. “We had moments where we performed to the best of our ability, but I feel like once we’re getting into conference play we’re really hitting our stride at the right time,” said Halpin. Halpin will be transferring to a four year college with an Associate of Arts degree in the fall, and plans to continue playing baseball there. “I’m definitely committed to my academics, but I understand that baseball is going to hopefully take me places where I’ll be able to succeed on the field and in the classroom,” said Halpin. Emilio Zertuche, film and television production major, 19. 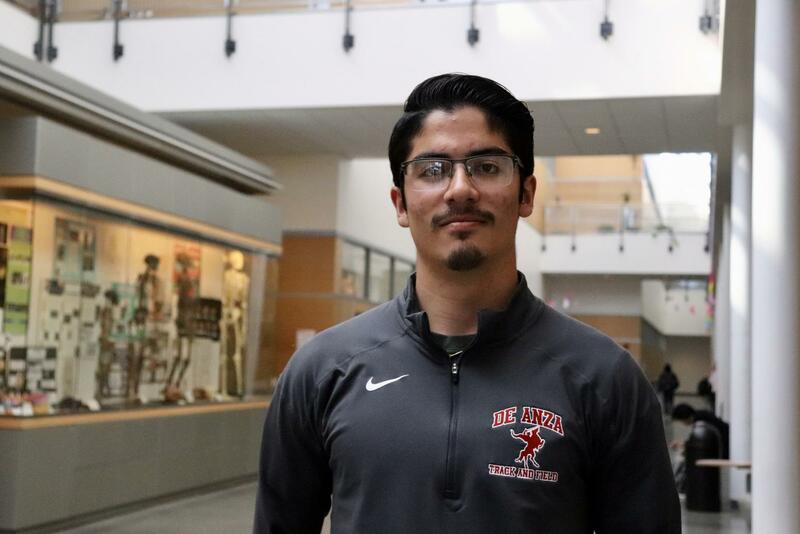 Being both the new kid on the block and the new team captain can be difficult, but it’s nothing that freshman and track runner Emilio Zertuche, 18, film and television production major, can’t handle. This is Zertuche’s eighth season running track after four years in high school, with three years as a team captain and on varsity in his sophomore, junior and senior year, as well as doing two years of off-season track. After deciding not to continue track after high school, Zertuche was sought out in one of his PE classes in fall quarter by head coach Mattis after being told about his skills. Currently, Zertuche is doing well so far in the season, holding the most points out of all the male freshmen as of last meet, and holds the fifth most points out of all the competing males. “Most of the success I’ve had has come from the 4×4 and working with the team, because that’s one of my favorite events, and I love to run with the team,” said Zertuche. With a current 3-0 standing in the season, he said if they continue with this upward trajectory that the team could do really well this season, which is the goal of the whole team. Although Zertuche is unsure if he will continue track after De Anza, he said that if the opportunity arises he would take it. 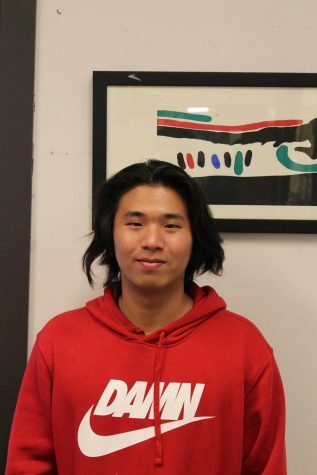 The 18 year old runner plans to transfer with his Associate of Arts degree in film and television production within two years. Dominic Simpkins, 18, communications major. 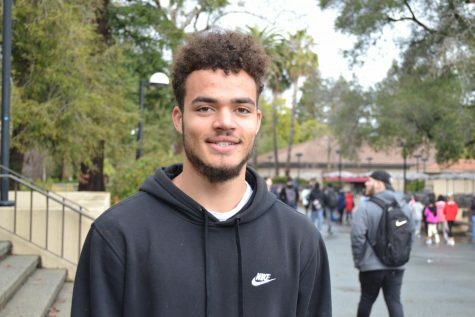 Dominic Simpkins, 18, communications major, plays for the De Anza College men’s basketball team as a guard and wing. 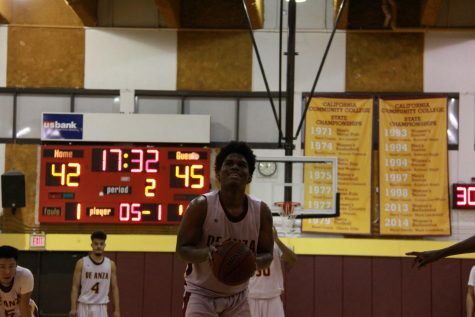 Only in his first year at De Anza, Simpkins has already made a big impact on the team offensively despite having to make the change to play as a power forward instead of his natural position as a shooting guard. Simpkins has been the most reliable player on the court this season, pushing the team to cut down leads or building one of their own through bursts of strong individual offensive plays. Having only won 10 games out of 28 this season, the Dons have faced a subpar season but Simpkins is confident in their improvements and is already looking ahead to next season. Having been given an honorary mention after only playing his first year, there are high hopes for him to continue this hot streak into the next season. Doryn Gomez, 19, psychology major. 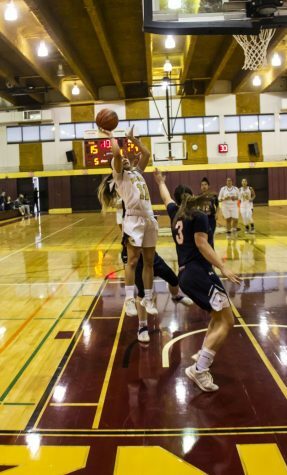 Despite the De Anza College women’s basketball team being a well-drilled unit with teamwork and team spirit as their star qualities, Doryn Gomez, 19, psychology major, is one of the players who has been on the team the longest. For Gomez, playing basketball has become something she’s known her entire life since childhood. Her admiration for basketball started at the age of five years old, as she went on to play the sport through all of middle school and high school. Now in her sophomore year in De Anza, Gomez has no plans on stopping basketball anytime soon. “I would love to play basketball and advance my academia jointly at a four year university,” said Gomez. 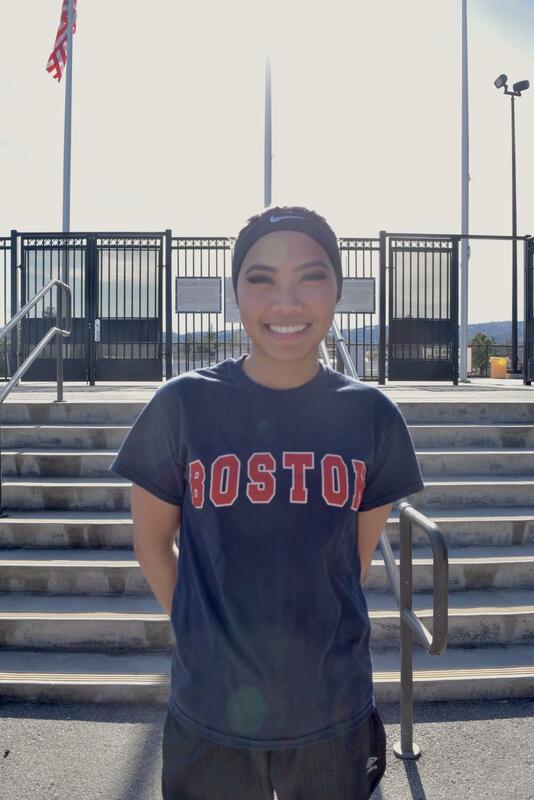 Balancing school and sports may be a challenge for some, but for Gomez, it is the opposite as she believes the sport fuels her studies. 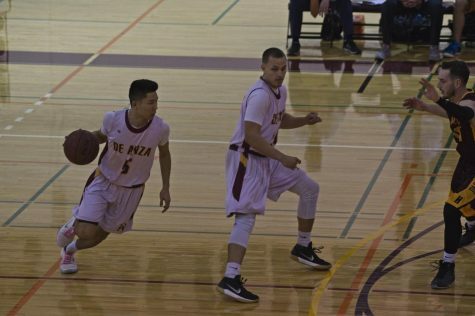 “Playing for De Anza really helped make the chaos of balancing a sport and school be more copacetic,” said Gomez. 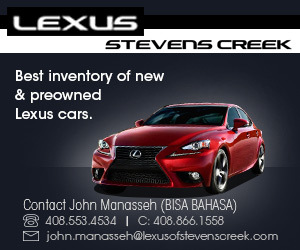 For someone who has been on the team for a while, she believes the balance comes with experience, in addition to the potential incentives that come with good grades. “I’m looking to maintain my GPA as of right now to open more scholarship opportunities,” said Gomez, having already received some recruitment offers.